2 Sew 4 U Embroidery Sewing has been a passion for many years. My paternal grandmother was an avid sewist and all her daughters. Sewing became an interest because the finished product is as beautiful as store bought. I purchased a home embroidery machine to finish cross stitch projects that were incomplete. Yet I did not open the box that housed this machine for about two months. I gained the courage to open the box to begin the unfinished cross stitch projects and read how this FABULOUS machine could do more than I could imagine. I practiced how to customize or personalize towels for a few weeks before I set goals as to how many towels I would add names. I then wanted to expand beyond my towel closet and began doing towels for ladies at church. Each week I would personalize approximately 5 towels, take them to church and give them away. 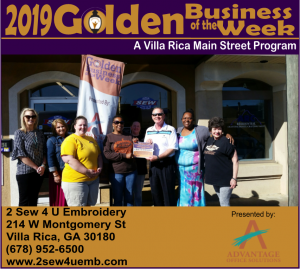 Word of mouth advertising and doing festivals, I advanced to a six needle embroidery machine; a few weeks later I advanced to a 12 needle commercial embroidery machine. With more festivals booked, the more power I needed. I purchased an RV, set up the embroidery machines and became 2 Sew 4 U Embroidery On the Move. Moved out of the RV into the garage with the purchase of yet another commercial embroidery machine. The garage only last a few months until a brick and mortar became imperative. We begin the store front May 2, 2016 in Villa Rica, GA 30180.